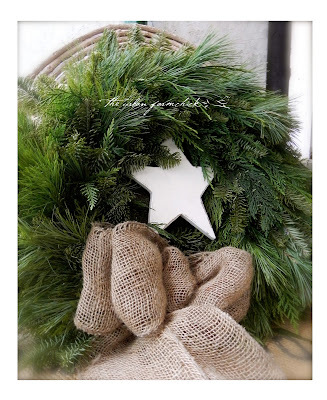 We made these wonderful vintage primitive shaped stars for the shop this season. They look fantastic pretty much anywhere you use them. I popped one into my front door wreath. I'm absolutely not a "glitzy" Christmas/Winter gal, the more natural the better and I just LOVE burlap bows. These yummy willow planters were made for the shop this season by Evelyn. They were stunning but my husband had to re-work them to a more manageable size. They look so festive when filled with mini-lights, topped with greens, twigs and a handmade winter star. If you look closely at the window you will see "Baxter" the cat getting in on the photo shoot. One of the lower level window boxes. 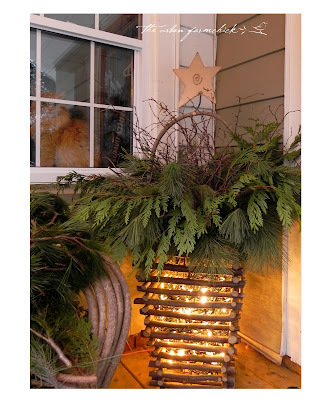 Mixed evergreen branches and by the way, I think that the lowly branches of the Jack Pine get a completely bad rap. They are long and gently droopy, fluffy and come with cones attached. Really, who could ask for more! 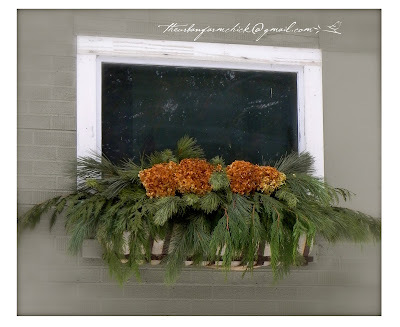 Then, to finish it off, compliments of inspiration from Lorraine's window boxes of seasons ago, frosted annabelle hydrangea stems. 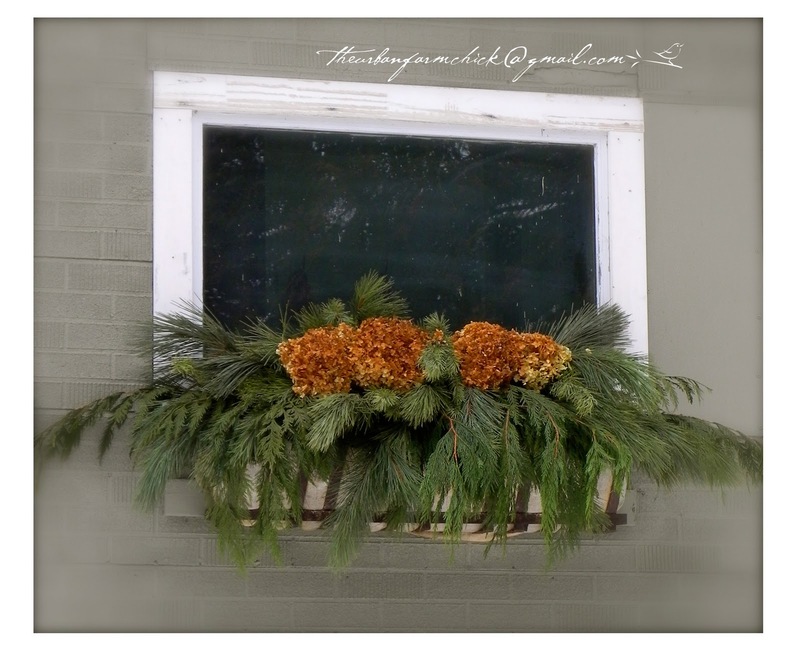 window boxes stuffed with the simple elegance of red pine and beautiful BC cedar. The summer gazebo structure remains throughout the winter and in a few days or so I'll be fashioning a candle lantern to hang from the center. Stay tuned. Anyone who knows me knows that I love, love, love birds nests. They are amazing structures of the most natural kind. This nest was built by a busy mom-to-be this spring on the beam of the porch of the studio shop. I was delighted to see her there, busy coming to and fro in anticipation of the chicks that would someday rest and grow there. Within days of the nest being finished we had hurricane style winds and I was horrified to find the nest blown to pieces, laying on the ground underneath the beam. But, unsurprisingly, I guess, within the day, she had rebuilt the nest, reusing and recycling the bits and pieces of her first attempt. I watched patiently for the flitting to and fro, signs of the hatching, but it never came. The studio was abuzz with activity over the following few weeks and I suspect that the banging of the old barn door as I went in and out may have sent her off in search of a much more calm and quiet roost upon which to have and raise her young. 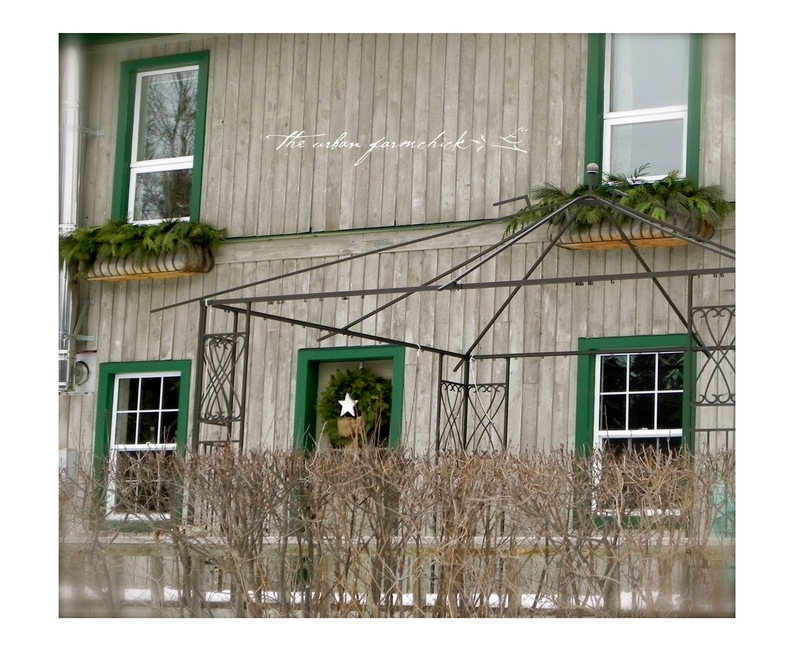 Oh well, maybe next year she'll build another and this time, I'll not use the old barn door. I harvested the nest just days ago. 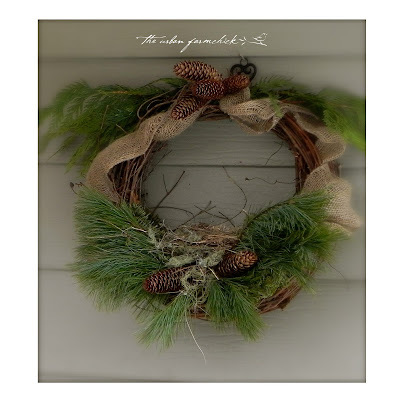 I fanned out the bottom of a grapevine wreath, tucked in some fresh Fraser Fir and White Pine branches, pine cones and a touch of burlap. This lovely nest wreath hangs on the wall by my back door entrance beside the rustic reclaimed storm door. Today and everyday . . .
Best Wishes . . .
We're almost done here . . .
Down for the count but still pluggin' along . . .
Peace on earth . . .